There is little doubt that information is key to effective taxation, and that modern data collection systems are making tax administrators' (and in some ways, honest taxpayers') lives much easier. I am personally wary of governments (or anyone) amassing all of the data gathering and analytic tools they might like, because I am concerned that life in the panopticon will not be tolerable for lots of reasons. My tolerance for leakage in taxpayer compliance to forestall the complete surveillance of all human activity by government may be higher or lower than others; I am not sure. But the following guest post by Gaute Solheim of the Norwegian Tax Administration gives a nice summary of the tax administrator's more optimistic view. Cross posted from the Surly Subgroup. In a previous post, I explained with reference to the Cui 2017 paper on Third Party Information Reporting (TPIR) why I expect good quality TPIR, based on a primitive analysis of the human factor in corporate filings. When I started rereading Cui’s paper, I only read a few lines before a chapter heading from the CIA textbook “The Psychology of Intelligence Analysis” popped into my mind: Do you really need more information? That book contains a full chapter (starting on page 51) on how more information sometimes contributed nothing to the quality of the analysis, but was of immense help for the confidence of the analyst. I will below make my argument for why the answer should be “yes” when it concerns the TPIR data mentioned by Cui in the paper, but it is a qualified yes. TPIR is a bit like cooking. Fantastic raw materials will not end up as gourmet meals on their own. You need a talented and skilled chef and a kitchen with the right tools, as well. Having spent some time on capacity-building with less developed tax administrations than the Norwegian, I agree with Cui that establishing a TPIR machinery should not be the first priority in these countries. However, TPIR being the wrong starting point for some developing countries is not an argument for abstaining from it in Norway and other jurisdictions with better-resourced administrations. I will below state my case for why I find TPIR useful based on my observations working for the Norwegian Tax Administration (NTA) (which may of course differ from the opinions of the NTA itself). My knowledge of U.S. or Canadian use of TPIR is limited, but there is a very fascinating story told in a paper by Keith Fogg about the work of the IRS agent Joe West. It is a story starting with an audit in the late eighties continuing into the nineties and ending with the IRS getting a summons for credit card information linking US taxpayers to bank accounts in the Caribbean. That information eliminated credit cards as an easy means of taxpayer access to evaded funds. Norway was quick to copy and paste the IRS methodology. First as specific requested information. Then, a few years later, TPIR routines were in place, giving us digitally all the credit card transactions from financial institutions. The information was used in a large audit project identifying Norwegians with undeclared financial wealth in other jurisdictions. It did not take long before it was common knowledge among taxpayers that this modus operandi did not fly anymore. The value of this TPIR as a tool to uncover hidden wealth and income in foreign jurisdictions diminished quickly, as measured in volume of reassessments. Collection of TPIR is not without costs, and after some years, the extra revenue from reassessments probably did not cover the total cost of the collection of this dataset. One could then conclude that this was a big heap of worthless gigabytes. To me that would be flawed logic, like concluding that a fence is pointless if you never find anyone on the wrong side of it. TPIR done right is to a large extent automated audits. Taxpayers knowing that they will be selected for audit on specific issues are inclined to stay compliant or shift to another, more cumbersome, modus operandi like diamonds in a toothpaste tube (see here and here). The toothpaste modus operandi had a shorter life span than the credit card scheme, and then we got FATCA and CRS. Calculating the value of TPIR as a mental fence keeping more taxpayers inside the compliance triangle would be a hard nut to crack. I will not even try, but I would be surprised if it was insignificant. The story starting with IRS agent Joe West auditing Dorchester Industries and owner Frank Wheaton Jr. in the eighties, and ending in Norway with a lot of TPIR data with few reassessments illustrates a life cycle. It started with tax authorities going out and collecting specific third-party information needed for cracking cases with serious tax evasion; it was later streamlined as part of the TPIR system; and it ended up as mental fences for tax compliance. Today, that specific TPIR has other analytical uses for the NTA as well. Almost all the numbers needed for producing a correct tax return for the majority of personal taxpayers in Norway already exist digitally on some third party computer somewhere. The number of sources is much smaller than the number of taxpayers. Having a system of distributing digital numbers from a small number of sources to everyone, having everyone manually punch the same numbers into different kinds of software on their home computers, and then collect all these numbers—with all their typing mistakes—does not make sense to me. It did not make sense in 2010, either. For most Norwegian taxpayers, it has not made sense the last two decades. The main use of TPIR in Norway today is to prepopulate individuals’ tax returns, which are then made available for the taxpayer for correction and amendments. All of this ensures that we may handle millions of tax returns untouched by humans, including auditing every single entry in most of them. The NTA can do this by relying on recycling of existing data established by the business sector as part of its recording of business transactions. Businesses do it on computers with software designed to handle these exchanges of information. It means that, as a taxpayer, I may go skiing this weekend instead of sitting indoors punching numbers into some tax program on a sunny winter weekend. I love it both as a taxpayer and from nine to five as a tax auditor. A new deduction wanted by the Norwegian government illustrates why TPIR is the way to go. The government wants personal expenses for toll roads to be deductible from income. There is a logic behind that, but that’s not my focus. The public toll roads are 100% digital and all payments are linked to an identified person. To avoid double deductions, the gross toll road payment must be reduced by the amount each individual has reclaimed from his employer or deducted as business expenses. A large part of these toll payments sits as digital information on the servers of the employers. The NTA’s way of thinking is that TPIR is our friend. The payments on cars registered to non-business people may be reported as TPIR from a few toll road operators. The correction for reclaimed or already deducted payments may be one more item in the existing TPIR filing from employers on each employee. We do not know at this stage what percentage of all the tax returns we may prepopulate with the correct deduction by using TPIR, but we are aiming very high. Designing the compliance program for this deduction without TPIR is not a tempting alternative. Establishing the infrastructure needed for TPIR of a specific set of data is the main cost. The exchange itself is comparably very low cost if the software doing the job is well designed and integrated in the data systems of the reporting entities. Ask any tax manager, and they will tell you that tax auditors asking for information that the Enterprise Resource Planning (ERP) software (which manages business processes and accounting) is already programmed to produce is a small burden compared to collecting ad hoc sets of data that the ERP is not programmed to report. We could do targeted audits, waiting three to five years and launch an identical audit program, collecting the same dataset ad hoc, and then spend a lot of resources on sorting out all the mistakes and non-compliance uncovered by the audits. It does not make sense in 2019 to operate like this. It is much more cost efficient to do the work needed to design the software and needed infrastructure that ensures that there will be a steady flow of good quality TPIR. Within the OECD, there is a program called SAF-T, Standard Audit File for Tax. The core of this is that businesses must run their accounting on software designed for exchange of data in a standard digital format. When this is implemented, my guess is that we will see a new drop in cost per gigabyte TPIR, and it will certainly reduce the taxpayer’s cost of handing over data in response to ad hoc requests. Portugal is at the forefront of using SAF-T, with ten years of experience, generating gigabytes of TPIR monthly on VAT transactions and much more (see here and here). The constant expansion of what tax administrations receive as TPIR should also influence the more rational taxpayers. They now know that you never know what the next dataset will be. Would you engage in a toothpaste scheme if you knew that FATCA was two years away? What tax administration veil of ignorance will be the next to fall with the help of TPIR? It gets harder and harder for the taxpayer to rationalize away the risk of future exposure of presently hidden activity. I will restate that TPIR is a superb ingredient in the hands of a skilled chef in a well-equipped kitchen, but add that you really need a close partnership with your suppliers to make it happen without prohibitive costs. Yes, we really need more information. Under what circumstances should we expect corporate entities to evade tax? The following guest post by Gaute Solheim of the Norwegian Tax Administration posits that it is most likely when they are small, owner-operator gigs, and much less likely when they are giant multinationals. The rationale, drawn from insights about why third party reporting is vital in a self-reporting system, is that the bigger the company, the more people have to work cooperatively to engage in fraud, many of whom will be employees with no direct economic upside. Of course there must be exceptions--Enron comes to mind. But Solheim's observation is that the human self-interest that makes third party reporting an effective compliance tool also minimizes the frequency and scope of Enron-type evasion. Cross posted from the Surly Subgroup. As I read Cui, he expect legal entities to cooperate sufficiently to ensure fairly good quality TPIR. He does some reasoning on why this is to be expected, but I did not find his arguments very convincing. This may be because for some years I have had a different line of reasoning ending with the same conclusion. What follows is based on material I used in a talk some ten years ago for my colleagues at the Large Taxpayer Office in Norway. The theme of that talk was why we found less evasion in our segment of taxpayers than what other tax auditors found when auditing smaller entities. I called the talk “The Human Factor in Tax Filing”. I believe the reasoning I used there also may explain high quality TPIR. To make it clear: This is about tax evasion (or deliberately misreporting). Tax avoidance is a different beast. I started out by observing that legal entities cannot write, and hence are unable to fill out their own tax returns. They need human beings to help them. My next observation was that you can split these “helpers” into two groups. Group one is humans with direct economic upside from evasion, typically the owner(s) of the entities. Group two is humans with no direct economic upside from evasion, typically employees without an owner interest. My third observation was that the influence these two groups had on the filings was strongly linked to the size of the entities. In the smallest one-person owner/manager entities, people with direct personal economic upside from evasion (group one) have a large influence on the numbers filed. In the largest multinational corporations, people with no personal direct economic upside from cheating (group two) do most of the work. Based on these unsystematic observations of reality, I made the following diagram of my estimate of how the influence of people with economic upside from misreporting (red line) and those without (blue line) varies as a function of entity size. The vertical axis goes from zero control to a hundred percent. On the horizontal axis, each entity is counted as one. I do not have empirical studies to back up any claim that the balance of influence between the two groups shift at a specific gross income or similar figure. If forced to make a guesstimate, I would, for Norway, say somewhere around USD 5 million, with big variations among business segments. I will, for the sake of simplicity, use USD 5 million as the crossing point. Corporations with less than USD 5 million in revenue are by far the main bulk of the population. Based on this perspective, we would logically start wondering why all these entities represented by humans with incentives to cheat average to a compliance rate of 90% or better. 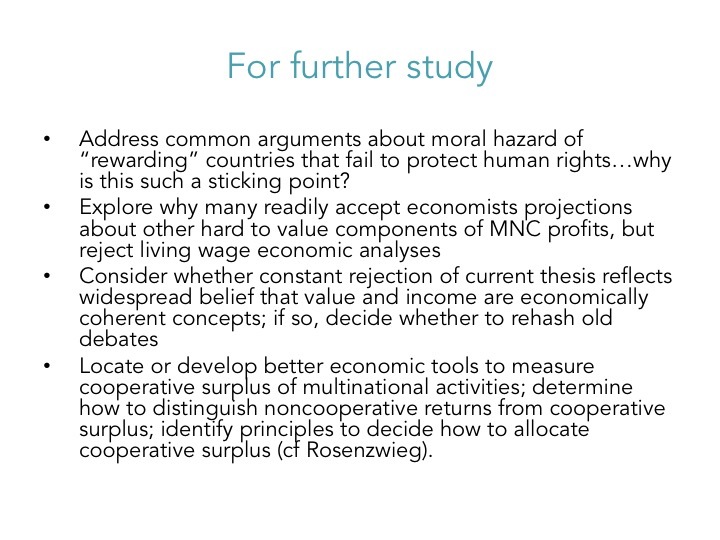 This is the perspective I understand Cui is debating in the last half of his paper, and he formulated some explanations that did not fully convince me. As a longtime tax auditor, the number of entities to me is an administrative problem. I’ve always measured my own work in money saved: How much of the tax gap did I manage to plug? To get this perspective on reality, I must change the unit of measurement on the horizontal axis from entities to dollars. Each entity claims a space equal to the share of the total government revenue collected or paid by that entity. Something very interesting happens to the perspective when we change from entities to dollars: The main bulk of government revenue is collected, reported and paid by the small group of big entities where the people with no upside is in full control over the numbers reported. 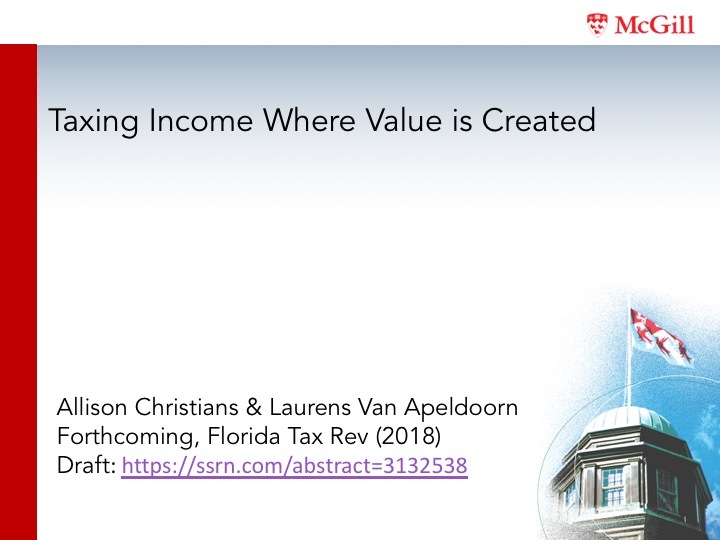 I only have hard numbers for corporate income tax (CIT) in Norway to back up this perspective, but I am confident that it holds true in general. Sixty-five percent of all CIT in Norway is paid by entities with revenue higher than approximately USD 150 million. The corporations with billions in revenue and thousands of employees are few, but they represent the bulk of what matters. When we use this perspective—money—we see that individuals with no personal gain from non-compliance handle the main share of input to the revenue collection machine and TPIR. This is true whether the reports are on wages and taxes withheld from them, VAT, or the entities’ own corporate income tax. There is another important human factor, the down side. I have observed legal entities with feelings only when someone employed by the entity has made a mistake and the mistake has become public. The public relation department will issue a statement telling the public “The entity is very sorry that a trusted person have failed to live up to the high ethical standards of the entity as explicitly laid out in internal memos, rules, etc.” Then they throw that someone under the bus. Everybody knows this. Since everybody knows this, it would be strange if that knowledge did not shape the behavior of the people engaged in taking care of compliance tasks on behalf of the huge impersonal corporation. They have no personal gain and they know who the scapegoat will be. Based on this rather simple analysis of the human factors involved, I am convinced that compliance and quality TPIR is what I in general should expect from large corporations. I do know from experience that in some particular settings this will not hold true, but the big picture is to expect compliance. I will now shift to the smaller entities. Cui gives a few examples illustrating how the employer and the employee have a win-win scenario in misreporting (cheating). He leaves out some elements that I find very practical in real life. I must confess that a few times in my life it has happened that I was guilty of doing something qualifying at least for a fine. But I’ve never been tempted to do something that relied on recruiting a partner in crime. Somehow human nature realises without thinking too hard about it that conspiracy is on a different scale than a moment of weak ethics. If you do not figure it out on your own, the penal code makes that very clear. The win-win situation described by Cui differs a lot from an owner/manager deciding to keep some income off the books. While you may do that alone as owner/manager, the Cui win-win may only be established by recruiting someone to take part in the scheme. In addition, the owner knows that employers and employees from time to time end up with conflicting interests. Lay-offs are but one example. From my limited knowledge of the US penal system and tax legislation, I have the impression that an employee deciding to inform the IRS about the misdeeds of a corporation may get much more lenient treatment than the corporation and the owner/manager of that corporation. As a hypothetical owner/manager, I would at least think twice. This is not saying that this kind of collusion does not happen. It does, but the human factor and a simple risk analysis informs me that it should be more the exception than the rule. Undeclared income is a much more likely scenario in the small corporations than manipulated TPIR. This result is not produced by the integrity of the corporation, which I believe has none, but is what you expect from human beings when acting based on the incentives present in the situation. The sum of these very human choices is what we may call a compliant corporation, sending the tax authorities high-quality TPIR. As Cui correctly observes, even high-quality TPIR is pointless if it does not contribute to something useful. Tax authorities are collectors of revenue, not of data points. Why I do not agree when Cui concludes that TPIR is not useful will be the theme for a later blog post. And again: This was about evasion, not avoidance. This Article uses the example of company-size classifications to explore the role of disproportionate impact and legislative intent in judicial review of Member State laws for nationality discrimination. Our discussion of disproportionate impact is mostly descriptive—we explore how the Court has resolved questions of quantum and proof in the cases. Our discussion of intent is mostly normative—we argue, contrary to current doctrine, that courts should consider the legislature’s intentions as probative, but not dispositive, of discrimination. We chose company size for two reasons. First, discussion of company size as covert nationality discrimination is new to the literature. Second, Member States increasingly use company-size classifications in tax laws; Poland and Hungary recently used turnover (as opposed to net income) to determine tax rates; and Spain proposes to use turnover to establish liability for its new digital services tax. To illustrate how the Court of Justice might apply our approach to size discrimination, we consider whether the company-size thresholds in Spain’s and the EU’s recent proposals for a digital services tax constitute covert nationality discrimination. More generally, cooperative negotiations at the OECD towards reform that would appropriately tax the modern, digital economy must account for limitations imposed by EU law, and in particular its prohibition on nationality discrimination. The tax policy colloquium at McGill is supported by a grant made by the law firm Spiegel Sohmer, Inc., for the purpose of fostering an academic community in which learning and scholarship may flourish. The land on which we gather is the traditional territory of the Kanien’keha:ka (Mohawk), a place which has long served as a site of meeting and exchange amongst nations. This fall the Colloquium explores a range of contemporary tax topics across three disciplines--law, economics, and philosophy. 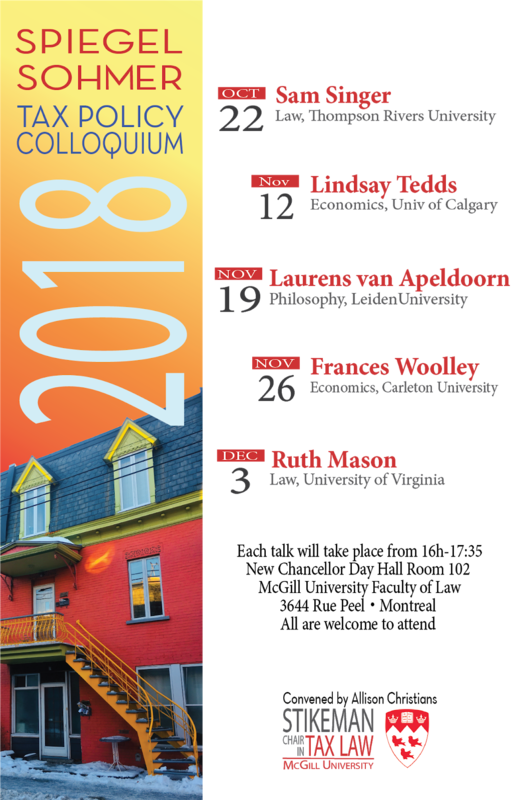 The complete colloquium schedule is below and more information is available here. The Colloquium is convened by Allison Christians, H. Heward Stikeman Chair in Taxation Law. As always, the colloquium is free and open to all. Prof Mason will speak on Monday December 3 at 4-5:30pm, New Chancellor Day Hall, Room 102. Today at McGill Law, Prof. Sam Singer of Thompson Rivers University will present his work in progress, entitled "Evaluating Canadian Tax Remission Orders: A Debt Relief Vehicle for Taxpayers," as part of the annual Spiegel Sohmer Tax Policy Colloquium at McGill Law. Remission orders, although rare, serve important functions in the Canadian tax system. This paper draws from a comprehensive study of federal tax remission orders issued between 1998 and 2017. It presents general findings about remission orders in that time period, including the number of remission orders issued, their reported costs, and the number of remission order applications. The paper identifies the five most common categories of reasons cited for granting remission orders. It then applies tax policy analysis to assess the two most frequent reasons for granting remission orders: to provide debt relief for financial hardship and/or extenuating circumstances, and to provide remedies for government errors and delays. This study also highlights concerns about the federal tax remission system, and provides recommendations for improving its fairness, transparency, and accountability. For those not familiar with the practice of remission in tax, this is a regime under which the taxpayer can ask the tax authority to forgive their tax debts, manly due to hardship or extenuating circumstances. This was a new concept to me when I came to McGill in 2012 and learned about a rather generous remission order granted to Blackberry in what I assumed to be a last-ditch effort in the nature of industrial policy and national protectionism--but Prof. Singer's paper makes clear that the remission order is not only (or even primarily) for massive multinational companies. I am bothered by the idea that the tax authority has a more or less obscure power to forgive the tax debts of some taxpayers under unclear circumstances and using criteria that are not transparent or reviewable. This seems to me to be a tool which could create great distrust in the tax system, in terms of both procedural fairness for taxpayers who don't know about or get remission orders but also in terms of the opacity behind which some officials appear to have a tool to help selected individuals at their will. I look forward to the discussion of Prof. Singer's paper and the implications of this research for the big questions of tax governance. The tax policy colloquium at McGill is supported by a grant made by the law firm Spiegel Sohmer, Inc., for the purpose of fostering an academic community in which learning and scholarship may flourish. The land on which we gather is the traditional territory of the Kanien’keha:ka (Mohawk), a place which has long served as a site of meeting and exchange amongst nations. 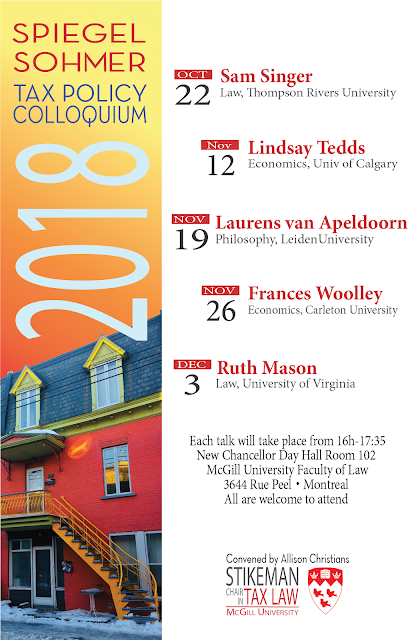 This fall the Colloquium will explore a range of contemporary tax topics across three disciplines--law, economics, and philosophy. The complete colloquium schedule is below and more information is available here. As always, the colloquium is free and open to all. The Colloquium is convened by Allison Christians, H. Heward Stikeman Chair in Taxation Law. Oct 22: Sam Singer, Assistant Professor, Faculty of Law, Thompson Rivers University. Prof. Singer's research focuses on tax dispute resolution, the policy rationales underlying tax measures, and the regulation of charities and charitable giving. Nov 12: Lindsay Tedds, Scientific Director of Fiscal and Economic Policy and Associate Professor, Department of Economics, University of Calgary. Dr. Tedds’ research focuses on tax policy and she has done extensive work with the Government of Canada in the areas of public economics and policy implementation. Nov 19: Laurens van Apeldoorn, Assistant Professor of Philosophy, Leiden University. Prof. Van Apeldoorn’s research examines the nature and prospects of the sovereign state, with a special focus on the normative aspects of international taxation rules in relation to the global justice. Nov 26: Frances Woolley, Full Professor, Department of Economics, Carleton University and President, Canadian Economics Association. Prof. Wooley’s expertise and research focus on economics of the family, gender and intra-house inequality, taxation and benefits for and of families, and feminist economics. Dec 3: Ruth Mason, Full Professor, School of Law, University of Virginia. Prof. Mason’s research focuses on international, comparative, and state taxation. 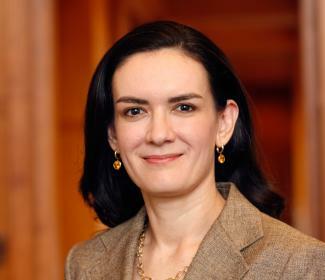 Her work on tax non-discrimination laws’ effect on cross-border commerce has been cited extensively, including by the U.S. Supreme Court. As always, colloquium presentations are open to all, and I will post more information closer to each date. Taxation involves the compulsory transfer of resources among members of society. Tax policy is concerned with how societies carry out taxation. That is a technical and legal question, but it is inescapably a political, social, and cultural one as well. To study tax policy is to engage simultaneously with the existential philosophical foundations of taxation: why and how societies tax. This introduction to tax policy theory presents an overview of tax policy discourse. The goal is to outline a working framework for reflection and analysis to examine the ways in which current assumptions and approaches require further development. Part I asks why we tax, and posits state-building, internal management, and negotiated expansion as three broad goals. 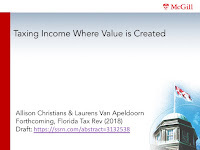 Part II asks how we should tax, and examines the conventional frameworks of equity, efficiency, and administrative capacity as the three guiding principles for most tax policy analysis. Part III concludes. I. 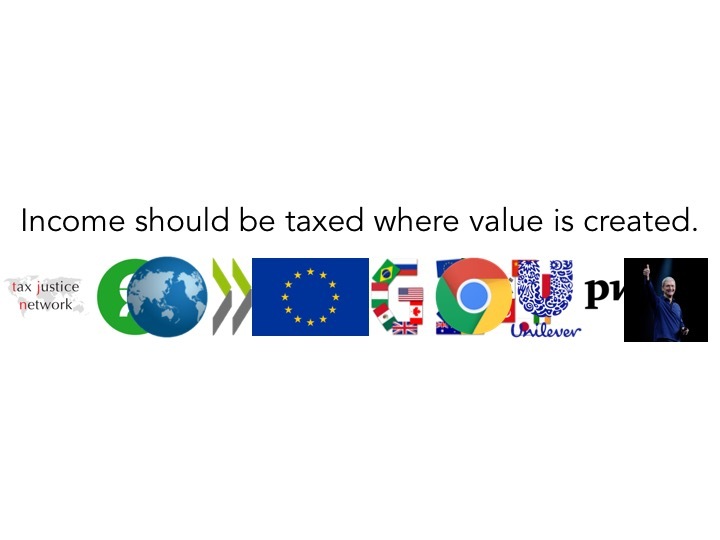 Why Do We Tax? Input as to what is missing is welcome; this is a work in progress. Subscribing to the core idea that income should be taxed where value is created, the international community has devised a set of tax base protecting rules to counter a world in which highly profitable multinational companies like Apple, Google, and Amazon pay very little in taxation. But these rules rely on assumptions about value that tend to allocate most revenues from international trade and commerce to rich countries while, whether intentionally or not, depriving poorer countries of their proper share. This article argues that a rigorous examination of what we mean by value would prompt changes in this allocation. 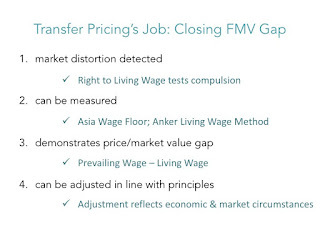 To demonstrate with a concrete example, the article examines wages paid to workers in low income countries and reveals a clear and well-documented gap between market price and fair market value resulting from labor exploitation. It then demonstrates how to apply this knowledge to existing international tax rule sets to reallocate profits to align more closely to the value-based ideal. 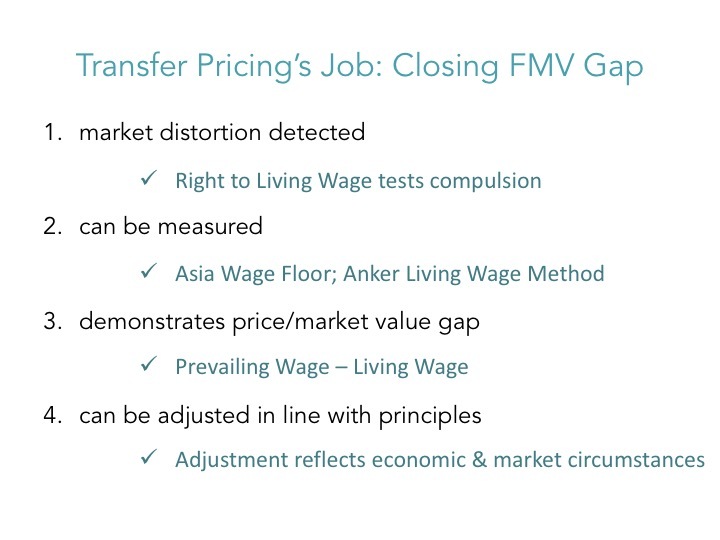 If accepted in principle, the proposed approach could be expanded beyond wages to consider other areas in which prices do not align with value creation. Ultimately this could provide a more detailed template to reallocate multinational revenues in a way that does not inappropriately benefit richer countries at the expense of poorer ones. My powerpoint presentation of the paper is available in PPT here and in PDF here. 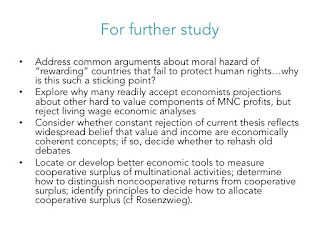 I have used various versions of this powerpoint in presenting this paper a couple of times now, with (hopefully) some improvements in each presentation. As depicted in one of my slides, I have encountered a perplexing mix of reactions to the ideas presented in this paper. Feedback ranges from "will make administration and compliance impossible for tax authorities and taxpayers alike" to "won't change anything, profit shifters gonna profit shift" to "great idea; doesn't go far enough." I wonder if a competent authority faced with a price adjusted per our proposal would see it as a position reasonable and consistent with the ALTP as we do, and whether it actually matters to the competent authority whether it is reasonable or consistent or not (I will admit that I am skeptical that competent authorities work out disputes among themselves on the merits: see this paper for why). This is still a work in progress and comments are welcome. I hear from law students all the time that an interview they thought went very very well didn't land them the job. A lot of the time (not always) these are female students. A lot of the time (not always) they were perfectly qualified and very capable. A lot of the time (not always) I think they probably would have done very well in a law firm job. I have no way to know any more than they did who got the job or why they didn't get the job. 1) You were wearing something uncomfortable. Believe me, it showed. If something is itchy or your feet hurt or whatever, if you thought for even one nanosecond about anything you were wearing, the interview was over that moment. Doubly over if you happened to inspect any part of yourself at any time. You were distracted, and your distress was noticeable. You did not go to this interview to impress someone with your impeccable taste in fashion. Be professional yes but be comfortable and laser focused at all times on why you are there. 2) The interviewer at any time looked at any piece of paper or a phone or iPad or anything but you. Clearly whatever was on the paper or the screen was more more important than you. You were supposed to be the star of this show, and you didn't command the full attention of your audience. Why is that? Are you waiting for the interviewer to ask you a good question, hopefully one that you meticulously prepared to answer? Why are you waiting for that? Your job in the interview is to actively engage the interviewer. Not the other way around. 3) There was more than one interviewer, and at some point they looked at or talked to one another instead of you. These interviewers are tired and they sat through a lot of interviewees today, making constant, mostly negative, judgments and decisions about a lot of people they don't know. They are looking for a way to take a mental pause during your interview. When you got lulled into that energy, you gave them the excuse; this is not a serious candidate, so we are on break now. If you don't wake them up, get them sitting straight in their chairs and laser focused on you, you will not get the job. 4) The interview mainly focused on your hobbies/other interests/places you've traveled; the firm's pro bono work; or its strong commitment to work-life balance. This is a job interview. You are being inspected for signs that you might not be 100% committed to living out your full life within the four walls of your office, serving the firm's paying clients with selfless dedication. You don't have any hobbies that don't involve reading the business section of the newspaper. (Note: take the hobbies or outside interests etc section off your resume and if anyone asks you what your hobbies are, they are: reading the business section of the newspaper, e.g., to see what new deals are unfolding. And then steer the conversation back to the job). 5) A day or a week after the interview, the thing you recollect the most is that the interview seemed pleasant and easy, and everyone was nice. You got a few minutes to make an impression that you are serious, capable, and a boss, and instead, you spent your time trying to be pleasant and unobtrusive. Stop trying to make people like you: you need to think about what you are doing that makes people not take you seriously. Is it your passive or deferential behaviour? Why do you think any law firm would want to hire a lawyer with those characteristics? They don't want to. So stop it. You can commit a lot of perception errors in an interview. These are only five of the ones I note on an annual basis. If you notice them happening, realizing you are in a hole could be the first step to changing the conversation.